Air pollution and dust are cutting solar energy output globally. According to a new research, airborne particles and their accumulation on solar cells are decreasing energy output by more than 25% in some regions of the world. The worst hit regions are also those investing a lot into solar energy installations, such as India, China, and the Arabian Peninsula. The research has been published online in the June 23rd issue of Environmental Science & Technology Letters. My colleagues in India were showing off some of their rooftop solar installations, and I was blown away by how dirty the panels were. I thought the dirt had to affect their efficiencies, but there weren't any studies out there estimating the losses. So we put together a comprehensive model to do just that. 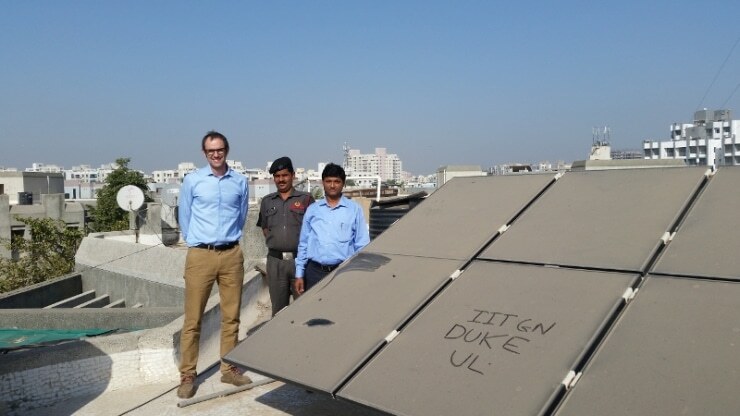 Collaborating with colleagues at the Indian Institute of Technology-Gandhinagar and the University of Wisconsin at Madison, Bergin measured the reduction in solar energy collected by the IITGN's solar panels as they became dirtier over a period. The data revealed a 50-percent jump in efficiency every time the panels were cleaned after being untouched for several weeks. The Researchers also sampled the dirt to examine its composition, revealing that 92% was dust while the remaining portion was made up of carbon and ion pollutants from human activity. Although this may sound like a small quantity, light is blocked more effectively by smaller man-made particles than by natural dust. Consequently, the human contributions to energy loss are much greater than those from dust, making the two sources approximately equal antagonists in this case. The manmade particles are also small and sticky, making them much more difficult to clean off. You might think you could just clean the solar panels more often, but the more you clean them, the higher your risk of damaging them. Having formerly examined pollutants discoloring India's Taj Mahal, Bergin had a good insight of how these different particles react to sunlight. Using his previous research as a base, he formulated an equation that accurately estimates the quantity of sunlight blocked by different compositions of solar panel pollution and dust accumulation. But dirt buildup on solar panels is not the only thing obstructing sunlight—the ambient particles in the air also have a screening effect. For that half of the sun-blocking equation, Bergin sought the help of Drew Shindell, Professor of Climate Sciences at Duke and an expert in using the NASA GISS Global Climate Model. Since the climate model already accounts for the quantity of the sun's energy obstructed by different types of airborne particles, it was not a stretch to estimate the effects of the particles on solar energy. The NASA model also estimates the quantity of particulate matter deposited on surfaces globally, providing a foundation for Bergin's equation to calculate how much sunlight would be obstructed by accumulated pollution and dust. The resulting calculations estimate the overall loss of solar energy production across all regions of the world. While the United States has comparatively little migratory dust, more dry regions such as Northern India, the Arabian Peninsula and Eastern China are facing heavy losses - 17 to 25% or more, assuming monthly cleanings. If cleanings happen every two months, those numbers climb to 25 or 35%. There are, of course, numerous variables that impact solar power production both on a regional and local level. For instance, a large construction zone can cause a rapid accumulation of dust on a nearby solar array. Compared to manmade pollutants, the Arabian Peninsula loses much more solar power to dust, Bergin said. But the reverse is true for regions of China, and regions of India are close behind. China is already looking at tens of billions of dollars being lost each year, with more than 80 percent of that coming from losses due to pollution. With the explosion of renewables taking place in China and their recent commitment to expanding their solar power capacity, that number is only going to go up. We always knew these pollutants were bad for human health and climate change, but now we've shown how bad they are for solar energy as well. It's yet another reason for policymakers worldwide to adopt emissions controls. This research was supported by the US Agency for International Development and the Office of the Vice Provost for Research at Duke University. What a plight that despite facing this on day to day basis, India did not have any studies to measure the effect of dust and pollution on the solar panels. Solar panels do not seem to be a feasible option for Indian conditions.